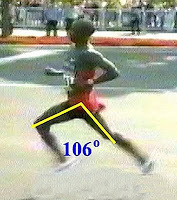 Could Stride Angles Be the Answer? 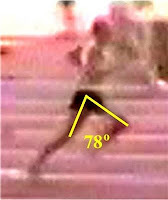 Check out this analysis by somasports comparing stride angles of Olympic marathon champion Sammy Wanjiru and our top Americans. No way to tell if photo of Ritz is taken actually at the widest stride angle. Still, this is food for thought. One workout Andrews picked up from Peter Coe (Sebasitan Coe's father and coach) was what Robby would call "the magic workout." It involved a series of sprints. He would start out with a 100-meter sprint at near race pace and jog back. He would then run 110 meters, adding one second to his 100-meter time. He would continue at 10-meter intervals, adding one second each time, until he reached 200 meters. It was a taxing workout, but magic indeed. He ran that workout before every big race this season, including his two national record runs and his 4:03.49 mile. -News Transcript (article about Robbie Andrews, a high school runner from New Jersey who set high school indoor national records for 800 (1:49.21)and 1000 meters (2:22.68). Outdoors Andrews ran a 4:03.49 mile. Tues- 5K in 19:31 (very very hot day) I could tell from the start this was going to be a tough run. Splits were 6:22, 6:11. 6:17- clearly I am not acclimatized for heat (skin was dry-never broke a sweat until after I finished!) so I was actuallly pleasantly surprised my last mile was not the slowest. Wed- easy 20 min with Sumo, then 50 minutes, followed by 6x15 sec sprints (if you can call them that). Watch for the name Maggie Vessey at the upcoming World Championships (if she gets to run- she did not make the US team but now has the A standard)-she just ran the fastest 800 meters in the world this year-1:57.84 in Monaco (#7 all time on the US list). Vessey lives in Santa Cruz with her sister and her sister's boyfriend and works 30 hours a week at Jerry's Sports (runnersworld.com interview). Somebody give this girl a contract please! Arthur Lydiard firmly believed that anaerobic workouts that produce lactic acid (i.e. interval training) during build-up of your aerobic base is counterproductive. "First thing: No. No. Never do anaerobic work in conditioning. Never. Ever." How long? "At least 12 weeks...The whole program takes 6 months." -Arthur Lydiard interview a week before his death. A workout that Lydiard recommended, and I admit that I have never done, is short bursts of running (60 meters) with full recovery. According to Lydiard, these short speed sessions can be used safely during your aerobic build-up phase because you don't produce lactic acid. At the same time, your ability to run fast is maintained or even improved because you are recruiting fast twitch fibers, increasing power and efficiency. Remember, the purpose is not improving anaerobic or aerobic energy systems. I'd start with 6 x 60 meters with full 1-2 minute recovery between each, then build to 10. This makes sense, especially for masters runners like myself who over time tend to lose speed with age. A word of caution- build into this workout slowly, especially if you've been doing nothing but long slow running. Build your speed with each repetition, so your first is always slowest and your last 2-3 your quickest. MY COMMENT: Good article- no question that runners could benefit by "Thirty minutes of daily barefoot locomotion" as a starting point (walking, then progessing to slow jogging if you can find a surface that allows it). I did this 2 hour workout on Tuesday. Thurs- easy 90 minutes on trail. Fri- easy 30 minutes on trail, then a 5K hard effort in 19:05. Felt ok but slow. Plenty of room to improve I hope. I felt some leg soreness from what I did the day before- 1 hour up and one hour back on the Lake Angeles Trail at a very slow pace. MY COMMENT: I really like some of the options the Lebert Equalizer bars provide. I am ordering this! I walked into a local nutrition supplement store recently and inquired what they had for runners. They introduced me to Rhodiola, a herb that grows in the mountains in Europe and Asia. Doing further research, I found this study out of Belgium. Compared with P (placebo), acute R (rhodiola) intake in Phase I increased (p <.05) time to exhaustion from 16.8 +/- 0.7 min to 17.2+/- 0.8 min. Accordingly, VO2peak (p <.05) and VCO2peak (p<.05) increased during R compared to P from 50.9 +/- 1.8 ml x min(-1) x kg(- )1 to 52.9 +/- 2.7 ml x min(-10) x kg(-1) (VO2peak) and from 60.0 +/- 2.3 ml x min(-1) x kg(-1) to 63.5+/- 2.7 ml x min(-1) x kg(-1) (VCO2peak). Pulmonary ventilation (p =.07) tended to increase more during R than during P (P: 115.9+/- 7.7 L/min; R: 124.8 +/- 7.7 L/min). All other parameters remained unchanged. PHASE II: Four-week R intake did not alter any of the variables measured. CONCLUSION: Acute Rhodiola rosea intake can improve endurance exercise capacity in young healthy volunteers. This response was not altered by prior daily 4-week Rhodiola intake. Looks like it has some stimulant properties not unlike caffeine, but long term use provides no additional benefit. His blog stevemagness.blogspot.com is excellent! View more presentations from sjm1368. 90 minutes on the trail today- I've got a loop that is approx. 3.5 miles in length that I was doing in 30 minutes (who knows maybe its 4 miles!). Doesn't matter, I am just going to continue building time slowly with a goal of 2 hours. July 16- 30 minute warm-up, then 3 laps on the 800 trail loop in 8:36 (7:52 per lap). July 18- 30 min warm-up, then 5 x 400 (approx) on the 800 meter trail loop (had to stop because I had walkers going on both halves of the loop at once. About an hour before the workout you should have about 20 ounces of liquid. -Leslie Bonci quoted in a NY Times article. MY COMMENT: Unless you are preparing for a marathon or getting ready for a very long (2 hours or longer) training run, I don't know anybody who really does this. Put in 2 solid days of running- back to back about 80 minutes on the trails. 30 at a slow pace with Sumo, then 50 more minutes at moderate pace. Legs were getting beat near the end of both days. Tomorrow something light! Skipping the 800 repeats this week. Watch the Tour de France Live ! Watch the Tour de France live here! Check out this article on active.com by Nancy Clark who always offers accurate nutrition advice. If you want better balance, increased speed and more agility, try integrating these fun and challenging plyometric drills into your weekly workouts. Marathon training can take up to 12 weeks to complete. You need a buildup (base) training phase and then a specific marathon training phase. I go 200 kilometers (124 miles) a week or more when I get ready for a marathon. At the end of this heavy training, you will need a tapering period of two to three weeks. I do a minimum of 10 to 12 long runs in that period. Four to six of those will be around 40 kilometers (24.8 miles), the rest between 25 and 30 kilometers (15 to 18 miles). MY COMMENT: Hendrick Ramaala is a self-coached S. African that won the NYC Marathon in 2004. Great Training Advice By an Olympic Champion- A Must Read! MY COMMENT: This is a MUST READ for any aspiring distance runner, especially if you are over 40! This is Not the Same Lance! Good workout today- I felt a little quad soreness in the morning but did not notice it running. Have to be careful with those- once in a while they can become chronic. 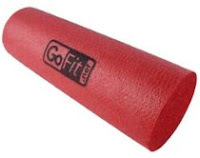 I'll have to start using the foam roller again. More good news is I hit 2 of the reps in 76. Are Cramps Related to Overdrinking? I met with a nutritionist on it and I think there are definitely some things that I can change, some overhydration problems that I've done in the weeks and days leading up to the race. You wash out the sodium and things like that that are necessary. It's a matter of drinking too much straight water until a couple of days beforehand. It takes a few days for your body to catch up. If you drink only water for two weeks and then you switch to sports drinks a couple of days before the race, it still doesn't have the desired effect runnersworld. MY COMMENT: I wonder how much water he was actually drinking in the days leading up to those races? Here is another reason not to overdrink before a big race. I did back to back identical workouts- 3 x 5K loops in Robin Hill, so 9 miles plus. Just putting in some miles all on trail. Tomorrow I hope to hit the 400s and feel good! The Fresh Air Fund looks like a good cause.- Since 1877, The Fresh Air Fund, a not-for-profit agency, has provided free summer experiences in the country to more than 1.7 million New York City children from disadvantaged communities. Each year, thousands of children visit volunteer host families in 13 states and Canada through the Friendly Town Program or attend one of five Fresh Air Fund camps. The half marathon fund raiser in NYC is Aug 16. How can you fall in a 600 and still win? MY COMMENT: The video tells all. Heather would have absolutely crushed this field had she not fallen. William Biwott Tanui, a 19 year old (reportedly) Kenyan, just ran 3:49 for the mile in Olso, Norway (Bislett Games). OK so maybe he's 20. Check out Bordin's log here. Lots of 60-80 min steady runs recorded but nothing about what pace he ran them. "Yes, I want to keep running," she said, "God gave me this talent and I am not going to waste it." Raevyn continues to get better by pushing herself in practice and being okay with having to hit faster times than her teammates. She said, "It's what makes me better." Raevyn is enjoying her first time competing at the USA Youth Championships and is ready to run hard again tomorrow. How Fast Will Solinsky Run? MY COMMENT: I am guessing, but let's say Chris weighed 175 last season, and now he weighs 165. Running a 13:12 the prior season, his maximal oxygen consumption must have been around 80 ml/kg. 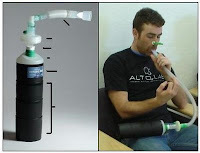 Doing the math, at 175 he was able to process 6.36 liters of oxygen (80 ml x 79.5 kg). At 165 (75 kg), assuming he can process the same amount of oxygen (6360 ml), his VO2 (ml/kg) jumps to 84.8 ml/kg (6360/75). There are other factors involved such as running economy, environment, hydation, nutrition, etc. but a 6% increase in V02 is more than enough to improve a 5K by several seconds. If he has, in fact, lost 10 pounds, even if a couple of those are muscle, watch for a breakthrough. Last week I did 10 x 400 on the Olympic Discovery Trail in hopes of improving my leg speed, and hit the last 5 under 80 seconds. Friday my times averaged about the same, although the slowest was 80 compared to 82. The goal? 10 in 75. Since this is a workout designed to improve speed, next time I'll consider taking longer than 1 min recovery. MY COMMENT: The studies to date point out this potential problem in serious, competitive racers, not recreational cyclists. Can You Run After Hip Replacement? Check out this interesting thread on letsrun.com. I was surprised! I received this email from my buddy Nick that I met in Bali-he was a soccer nut back then but has since converted to a serious runner. Ok. I have been doing long runs of 30k. 20k per day around that. with no speed. Just 5 min ks. Base work or in periodisation terms preparation phase. I have been amazed at how fast i have ran in this phase (ie, the 74 min half) The next phase is precompetition phase. So that = injecting some speed into the week via an interval session 1k repeats. and lowering the weekly mileage. (ie, 100k) Probably keep going between track and road/xc and leave the marathon for 3-4yrs time. I have a 5 yr plan and i am about 13 months into it :) My week will now look like this. Sunday 30k long run or 20k threshold run or race. The three sessions in bold are the important ones. Recovery from these is also going to be a factor. MY COMMENT: I love the plan- Curious how long you spend on precompetition doing 2 x 30 K runs per week. When you introduce those long intervals, I'd not worry so much about running them too fast- focus on short recovery, number (how many? ), and running form. What's the final goal? (Note: I'll look into adding a forum here- I would love to get some discussions going).